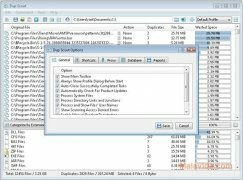 As time goes by and the more you use a computer, it becomes more probable for duplicate files ending up stored on your PC, something that can be really tedious to look into and solve if you don't have an application like Dup Scout. One of the most noteworthy things of Dup Scout is the way in which it offers the user information, specifying the duplicate file and the space that it occupies on the hard drive, but what's more, the information can be shown in such a way that it will be possible to know what type of files have been duplicated the most, and even access this information by means of pie charts. The search and indexing system implemented in Dup Scout allows us to select the areas of the hard drive that are going to be scanned in search of duplicate files, with the added possibility to select a full hard drive o just a series of folders. Duplicate files on the cloud. Dup Scout offers us the possibility to be able to define external servers on which it will also be able to perform the search for duplicate files, thus it can also be used to check if there are backups of certain files. Therefore, if you want to free space on the hard drive by removing duplicate files, download Dup Scout, it's free.